Heavens, such a lot we’ve learned about iPhoto. You know your way around the interface, you’re up to speed on importing your images, you grok Photo Stream, and you can edit your images so they have more pow! and less patooey! In this lesson we turn to organizing and packaging your images. As you know, iPhoto automatically organizes your images into events. But the application provides plenty of other avenues for image organization. The main thoroughfare in this regard is albums. With iPhoto you can create two kinds of albums. The first I’ll term the regular ol’ album. This type is akin to a paper photo album that you’d pick up at your local stationery emporium or photo processing store (if it hadn’t gone out of business five years ago). With this variety of album, you add and arrange the images you want that album to contain. The second type is the smart album. We discussed Apple’s smart searching and smart albums way back in lesson 9. 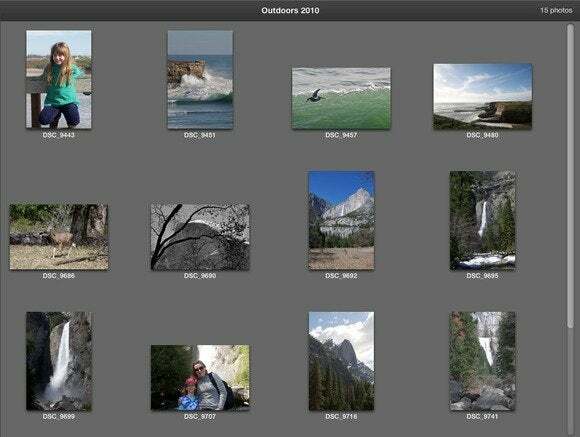 The same principle applies here: You organize images into albums based on particular search conditions—for example, images you captured with your Canon point-and-shoot between January 1 and January 11, 2011, that you’ve rated 4 stars or better. Let’s take a look at how each album works. If you’ve selected one or more events, images, or faces, and you choose this command, the new album will contain all the selected images (including all the images within selected events and faces). The name of the album is automatically highlighted, which is your cue to rename it. Regular ol' albums are easy to make and a good way to organize images. You can now arrange the album’s images in the order you prefer; just click and drag to move them. Additionally you can enlarge their thumbnails by adjusting the Zoom slider at the bottom-left corner of the iPhoto window. You can treat images within albums just as you do any other image in iPhoto. The one behavior that differs from the image you originally selected is that when you delete an image from an album, you’re not throwing it away. Rather, you’re simply deleting the reference to it from the album. The original image stays within your iPhoto library and in the location where you originally selected it. As I explained earlier, iPhoto creates smart albums based on one or more conditions that you set up. To make such an album, choose File > New Smart Album (Command-Option-N). When you do so, a sheet appears. Within this sheet you’ll find a field for entering a name for your smart album, as well as a single condition configured to read Album Is Any. If you were to click OK at this point, you would create a smart album containing any image that appears within any of your regular ol’ albums. As with other “smart” features, you configure iPhoto’s smart album conditions through a series of pop-up menus. Clicking the first menu (the one that reads Album by default) produces entries for Any Text, Description, Date, Event, Filename, Keyword, My Rating, Place Photo, Title, Aperture, Camera Model, Flash, Focal Length, ISO, and Shutter Speed. As a photo dabbler, you may not fully understand what all those things are. However, the length of the list hints that iPhoto offers a lot of ways to identify photos for inclusion in such an album. A smart album carefully configured with conditions can help you organize your images. The second pop-up menu narrows the condition further. For example, if you’ve chosen Event in the first pop-up, the second offers several options: Is In The Last, Is Not In The Last, Contains, Does Not Contain. The final field is almost always blank, allowing you to enter search terms. In this case you might enter Hawaii if the first two pop-up menus are configured to read Place Is. And you’re not confined to a single condition. Clicking the plus (+) button next to the first condition adds another one that is just as configurable as the first. With enough conditions correctly configured, you should be able to gather together exactly the images you wish to, easily.